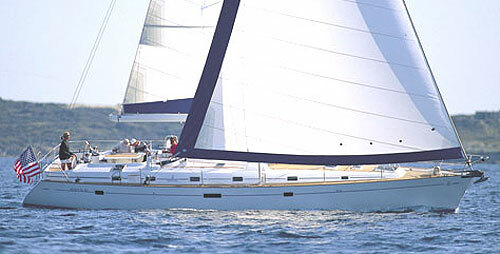 Sailing Yacht Bleu Turquoise is a fully crewed Beneteau 50 available for charter in the Virgin Islands of the Caribbean Sea. Beneteau’s are well known for their reliability, performance and comfort both in port and at sea and Bleu Turquoise is no exception. This well kept yacht is perfect for even those considering a Bareboat plus crew option as her affordable price is very competitive with the bareboat operators 50’s. 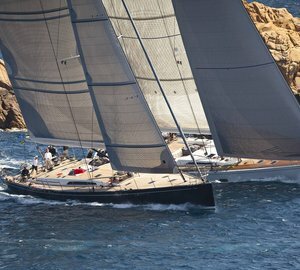 Luxury Sailing Yacht Bleu Turquoises’ layout offers wide side decks; a covered bulwark and thoughtfully located hatches ensure easy and safe circulation on deck. For efficient and comfortable cruising, the Bleu Turquoise features a dual cockpit configuration: the guest cockpit is very comfortable and well protected offering guests plenty of space to lounge around the cockpit table and enjoy the views or an alfresco dinner under the stars. The crew cockpit has two steering positions and directly accessible winches for the helmsman. The Bleu Turquoise offers four comfortable guest double cabins, each with its independent head compartment and a separate crew cabin in the forepeak. She takes up to six guests on charter. 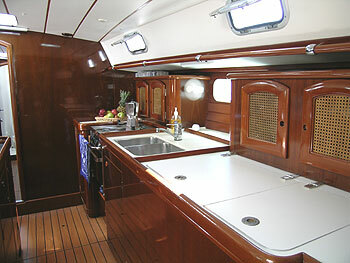 Wild Cherry wood detail gives this yacht a stunning and luxurious interior which is very pleasing on the eye. 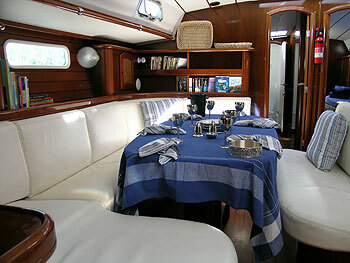 The large saloon can easily accommodate six people for interior dining and the galley is adapted to the needs of the most demanding Cordon Bleu chef. 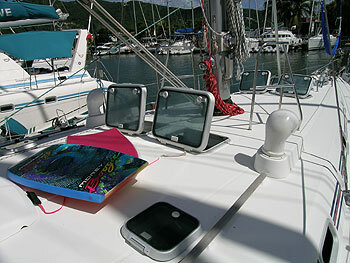 Light and ventilation are ensured by many opening hatches and ports. The two owners of the Bleu Turquoise are husband and wife. Crewing charters in the BVI, whose waters they had grown familiar with over more than 10 years, proved the perfect complement to Michèle’s and Michel’s love of ocean sailing, adventure, good food, and fine company. 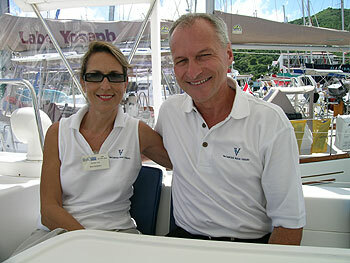 They will be your gracious host during your unforgettable vacation in the Virgin Islands on Sailing Yacht Bleu Turquoise. 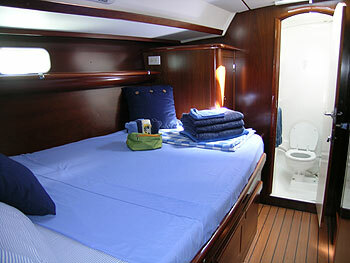 Bleu Turquoise has four double cabins with ensuite bathrooms available to guests. She will take up to six guests on charter. 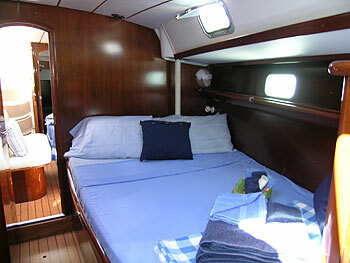 The aft cabins are good size doubles and the forward cabins a smaller doubles but have more head room. The crew quarters are separate from the guest accommodation. 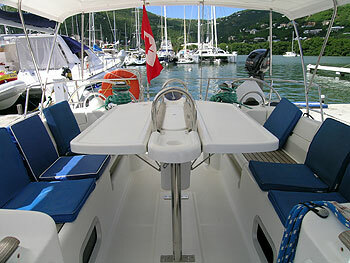 The large salon has comfortable seating for six and the cockpit also offers comfortable ding for up to eight guests. Tender with outboard, donut, snorkeling equipment, Kayaks and rendezvous scuba diving can be arranged at the guests request.